First Line: It didn't take much imagination to guess what the other kids had called Harry Schmittberger when he was a boy. Harry Schmittberger has gotten the short end of the stick all his life. He's convinced that his name started that whole bad luck ball rolling. Frank Pacheco is Native American, old, and has cancer, but he feels that he has one more fight left in him. Ricky McBride is young, strong, and not the brightest bulb in the chandelier. All he wants is to give his beloved wife and young daughter a good life. Calamity refuses to leave these three men alone, and they find themselves washed ashore on a desert island called No Hope. But they refuse to give up, and these three men who really have nothing in common find themselves becoming friends... and formulating a plan to bring much-deserved happiness and prosperity to them all. You see, there's a fabulous gold mine lost for over a hundred years in the Chocolate Mountains of Arizona. Sure it's right in the middle of the largest military artillery range in the world, but that shouldn't stop these three men from their objective-- should it? This book is not for the easily offended or those who prefer not to read about people who inhabit the bottom rungs of society. But for readers who can look past the profanity, violence, and frequent mentions of various bodily fluids, there is a terrific tale of friendship to be found. Of the three main characters, I found Harry to be the hardest to digest, but even he managed to work his way past my defenses. Frank's two marijuana-growing grandsons and his daughter (who scares the spit out of everyone she meets) are excellent additions to Shaw's cast of characters. Big Maria has a very cinematic quality to it, which isn't that unusual since the author is a playwright and screenwriter. The entire book flows smoothly, each scene vivid in my mind. Referring to a book as "cinematic" can sometimes be pejorative to me, meaning that the author really wants to turn it into a movie as quickly as possible. That's not true of this book. This is a well-crafted tale that really makes me care about what happens to Harry, Frank and Ricky. I want these three losers to have a Happily Ever After as I laugh, wince, shake my head, get teary-eyed, and laugh some more all through their misbegotten caper. 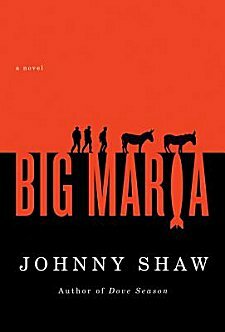 Johnny Shaw's novel may take you a bit outside your comfort zone, but the results can be very rewarding indeed. Nice review. I'm looking forward to this one. Thanks, Elizabeth. I thought I would enjoy this one, but I was surprised at just how much I did... if that makes sense!